OSWEGO, NY – St. Mary of the Assumption Catholic Church, 103 W. Seventh St., will host its annual Parish Bazaar July 8, 9 and 10, with a rain date of July 11. Rev. 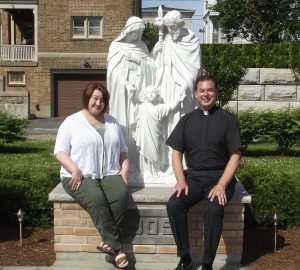 John F. Hogan Jr. pastor of St. Mary of the Assumption Church meets with co-chair of the Parish Bazaar Committee Michelle Brown in the church’s Prayer Garden to discuss the preparation for this year’s bazaar. The bazaar features plenty of food from St. Mary’s famous chicken barbeque, sausage and clams to fried dough, ice cream and homemade pies. There will also be a variety of fun and games for the entire family including: a cake booth, basket booth, Kiddie Land, nightly 50 / 50 drawings, and a chance to win $5,000 with St. Mary’s Annual Big Money Drawing. In addition, St. Mary’s Bazaar will host live entertainment each night. Friday night it’s Bob Riggio and RRR Music; Saturday night it’s George Hoffman who’s heard every Thursday morning on “The Dinosaur” radio stations; and Sunday it’s a special live performance from one of Oswego’s favorites, Paul Vandish. A seasoned professional keyboardist and lead vocalist, Vandish is well known as half of the popular duo Side by Side that played all across New York State for several years. Vandish entertains audiences with a blend of classic oldies and standards as well as popular contemporary music of today. Held in the church parking lot at 103 W. Seventh St., the bazaar will run July 8 from 6 – 10 p.m., July 9 from 5 to 10 p.m. and July 10 from 5 to 8 p.m., with a rain date of July 11 from 6 to 9 p.m.